Whether you have a large band or a small band the cast sheet is a very useful tool. The cast sheet will display and print all symbols, labels, and names of the performers in the drill. When you select Print Cast Sheet from the File the Cast List Editor will display. 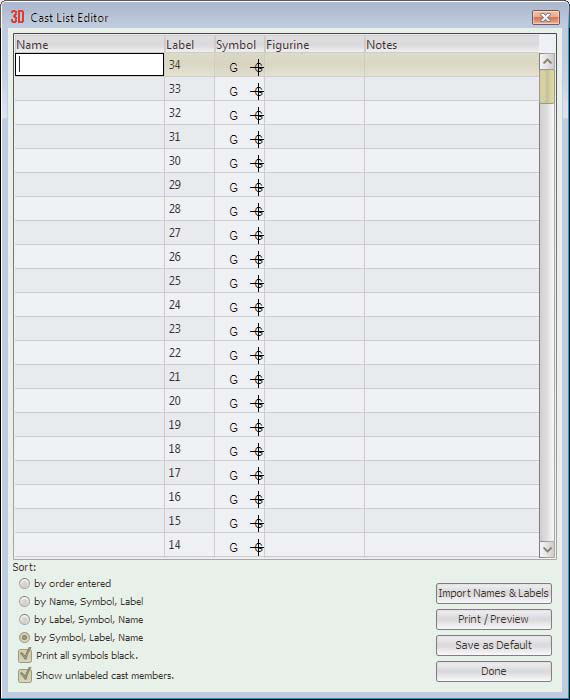 Print Sort order will sort the names in the cast sheet according to one of the following options: by “Symbol, Label, Name”, by order entered, by “Name, Symbol, Label”, or by “Label, Symbol Name”. The name is entered using the Label tool or can be entered directly from this dialog, the Cast List Editor. The Notes column is a space on the printout for taking notes of performers during rehearsals. Print all symbols black will print all symbols in the Cast Sheet black instead of the color defined in the label function. Show unlabeled cast members shows all performers (even the performers with no label) on the Cast List Editor window and in the printout. Hiding unlabeled performers from a printout is useful if you entered some performers as markers on the field and not actually performers. 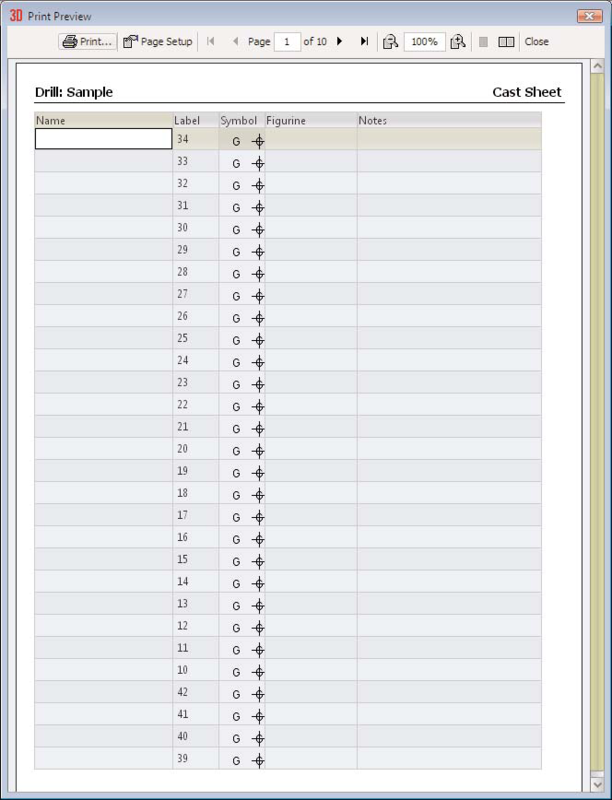 Print/Preview will open the page setup display then render and display a preview of the Cast Sheet report according to the settings of the print cast sheet manager. Previous Page will move to the preview preview page of the print job. Cast list names and labels can be imported from one drill to another. This is very handy when you add cast list information such as cast member names or labels to a drill after you have finished it. This is often done if you have purchased a custom or pre-written drill. You’ll typically want to import into your drill the cast information of the previous drill of the show you are writing. The set at the first count of the drill you are editing is typically the same as the set at the last count of the drill you are importing from. Import will find the counts with matching formations in both drills, look up the name and/or label of each performer and then set that name and/or label in the drill you are editing. Select Print Cast List from the File or Cast List Editor from the Utilities. 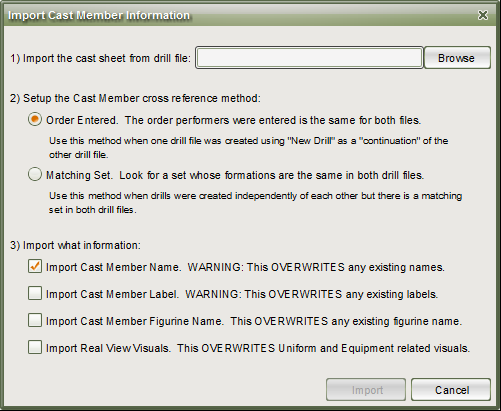 Click Browse and find the drill whose cast list information you want to import into this drill. Method 1: Order entered. Once you have finished a drill file, if you start another drill file using the “this drill is a continuation of the drill…” option then both drills will have performers entered in the same order. However, should you add new performers later, then the order may no longer be the same (at least for the newly added performers) and the second cross reference method may give you better results. Method 2: Matching Set. This scans both drill files and looks for a set whose formations are exactly the same in both. Then it copies the cast information from one to the other. Choose what information you want to import. The information can be cast list name and label. It is important to remember that the name and/or labels of performers that are found in both drills will be overwritten in the drill you have opened. Click Import to begin the search and copy the cast information into your drill. When you click Done in the Cast List Editor, you will be asked if you want to save the changes. If you do not want the changes saved, you can click “No” here and nothing will be saved from the import.